A man claiming to be Boko Haram leader Abubakar Shekau said more than 200 girls kidnapped by the group six months ago had been “married off” to its fighters, contradicting Nigerian government claims they would soon be freed. A passenger spaceship being developed by Richard Branson's Virgin Galactic company crashed during a test flight on Friday near the Mojave Air and Space Port in California, killing one pilot and seriously injuring the other, officials said. Burkina Faso's military backed a presidential guard officer on Saturday to lead a transitional government after the resignation of President Blaise Compaore, resolving a power struggle within the armed forces by sidelining the chief of staff. The Democratic opponent of South Carolina's Indian-origin Governor Nikki Haley called her a "whore", but more shockingly the mainstream US media largely ignored the story. 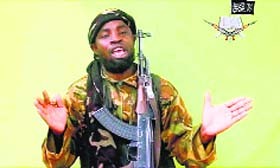 Nigeria’s military says it killed Shekau a year ago, and authorities said in September that they had also killed an imposter posting as him in videos. In the latest recording it is hard to see the man’s face as he his filmed from a distance. But it is likely to raise grave doubts about whether talks between a Boko Haram faction and the government in neighbouring Chad will secure the release of the girls, who were kidnapped from a secondary school in Chibok, northeast Nigeria, in April. The majority of the kidnapped girls were Christians. The man in the video also denied there was a ceasefire, and denounced Ahmadu, who says he represents Boko Haram in Chad. The issue of the girls is long forgotten because I have long ago married them off and they are all in their husbands' houses. 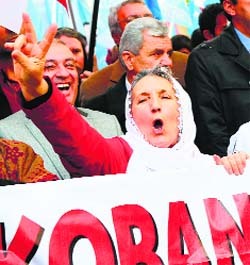 In this war, there is no going back. The crash of the suborbital vehicle, undergoing its first powered test flight since January over the Mojave Desert, 150 km north of Los Angeles, came days after another private space company, Orbital Sciences Corp, lost a rocket in an explosion moments after liftoff in Virginia. The back-to-back accidents dealt a blow to the fledgling commercial space launch industry, which has been taking on more work traditionally done by the US government while expanding for-profit space markets, including tourism. One pilot was killed in the crash and his body was found in the wreckage, while the second pilot, who ejected and parachuted to the ground, survived with serious injuries, Youngblood said. The survivor was found more than a mile from the main wreckage, he said. 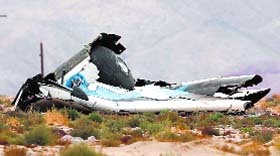 Both crew members were test pilots for Scaled Composites, the Northrop Grumman Corp subsidiary that designed and built the spacecraft for Virgin and lost three other employees in a July 2007 ground test accident. Friday's crash marked a major setback for Virgin Galactic, a US offshoot of billionaire Branson's London-based Virgin Group. The company was aiming to make the world's first commercial suborbital space flights with SpaceShipTwo, a six-passenger, two-pilot spacecraft. The launch was to have been the first in a series of test flights leading up to Virgin Galactic's maiden flight beyond Earth's atmosphere. More than 800 people have paid or put down deposits to eventually fly aboard the spaceship, which is hauled to an altitude of about 45,000 feet (13.7 km) and released by Virgin's White Knight Two carrier jet airplane. Cost of a ride on the ship now goes for $250,000 and among those who have signed up are celebrities including singer Lady Gaga and actors Angelina Jolie and Ashton Kutcher. Senior military officials had held talks on Saturday aimed at averting bloodshed after Lieutenant Colonel Isaac Zida declared himself head of state in an early morning radio address, overruling military chief General Honore Traore's claim to lead the transitional government.